At an IEEE (Institute of Electrical and Electronics Engineers) presentation, Dr M Capelli-Schellpfeffer discussed the results of a ten year study involving 120,000 employees at Electricite de France (EDF). On average, 125 electrical incidents occurred per annum. Seventy-seven percent of these were electric arc related, 21% resulted in permanent disabilities and 2.4% were fatalities. The NFPA 70E – 2012 Standard for Electrical Safety in the Workplace requires that systems (Electrical Safety Programmes) are developed to address electrical safety. Electrical arc flash safety must be achieved through a programme which addresses all aspects relating to engineering, behaviour, personal protective equipment (PPE), auditing and systems. This article examines arc rated PPE by explaining the phenomenon of an arc, the do’s and don’ts of PPE, the relevant standards concluding with the importance of an electrical safety programme. Arc rated PPE is only one part of an electrical safety programme and end users should be cautious about the exclusive use of PPE to mitigate arc flash hazards. 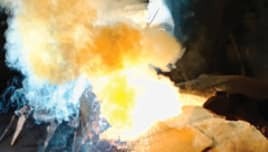 An electrical arc flash originates from a breakdown in the insulation medium creating a conductive plasma which can reach temperatures exceeding 20,000° C. Heat propagates from the plasma in the form of a plasma spray and infrared radiation. Workers operating on electrical equipment posing an electrical arc flash hazard should be protected against such high temperatures. At present, companies already provide hard hats, face shields, overalls, shoes and gloves, so why regulate clothing for electrical arc flash? The intent of generic PPE was mechanical impact withstand, chemical and dust ingress protection, minimising cuts and bruising among a host of other workplace hazards. Consider a face shield, which displays excellent mechanical withstand capabilities now being exposed to a 20,000° C electrical arc flash. The face shield will melt and the molten matter will ensure that the heat of the electrical arc remains attached to the skin of the worker long after the electrical flash has cleared. Most over the counter overalls protect against small welding/cutting arcs and fires which are not in the frame of reference of an electrical arc flash. This type of clothing will most often ignite, leaving workers with a poor chance of survival – and severe burns. 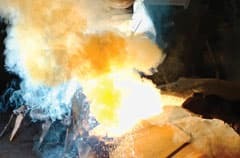 In order to demonstrate this point, ArcWear.com, an arc flash testing specialist, compared the performance of common workplace overalls when exposed to an electric arc. Figure 1 shows the test rig with three samples consisting of an aramid, polyester cotton combination and cotton. When the arc was initiated all three clothing types ignited. After arc extinction, the aramid stopped burning. The polyester cotton burned and dripped, while the cotton only burned without dripping. This study presented an important finding which was able to explain why 80 percent of all fatal and disabling injuries result from the ignition of clothing. An electrical arc flash results in energy propagation. The available energy varies according to the system fault level (kA), construction of the electrical apparatus, fault clearing time and other protection characteristics. The incident energy received by the worker depends on the distance between the worker, the arc energy and directionality. Energy is measured in Calories, although Joules are also widely used. When referring to arc energies, we are more concerned with energy densities, hence the unit of measure of the available arc energy and the incident arc energy is cal/cm2 (or J/cm2 or kW.s/cm2). If the incident energy from an electrical arc flash is completely dissipated by the personal protective equipment then no further energy can be transmitted to the body of the worker. This is the ideal case. In reality, heat transmission to the worker’s body does occur (measured in terms of a Stoll curve differential). Human tissue can dissipate a measure of heat before the onset of second degree burns. In the early 1960s, Alice Stoll conducted studies on humans (academics and sailors) and animals2. A predetermined amount of energy was exposed to skin for a certain period of time which gave rise to the definition of a second degree burn (also termed a blister burn). This is the point at which the epidermis burns and separates from the dermis. In terms of the thermal energy, second degree burns will occur at energies on human skin exceeding 1.2cal/cm2. In other words, PPE should then dissipate or reflect enough energy so that the residual energy transmitted to the worker never exceeds 1.2cal/cm2. The work of Stoll was very important as it provided a measure for human tissue burns as a function of heat flux, time and change in temperature. Third degree burns often result in permanent disability and death, but so can second degree burns if over a large extent of the body. The ignition of clothing is usually the main culprit. In the case of a third degree burn the epidermis and dermis is completely destroyed. The complete destruction of capillaries, nerve and muscle makes recovery highly improbable. Picture 1, taken on December 3, 2009, shows a burn victim with extensive third degree burns. The worker was unfortunately not protected by arc rated PPE and only survived for a few days. Picture 2, an unrelated case, shows equipment failure which provided an arc energy of 50cal/cm2 during an arc blast incident. The incident energy is believed to be around 20cal/cm2 according to arc rated clothing expert Hugh Hoagland from ArcWear.com. The worker used a 90cal/cm2 flash suit jacket and non-arc rated trousers as shown in Picture 3. The brunt of the arc flash was over his right hand with very little energy over the trouser. The worker did not suffer any effects on the right hand, but did experience ‘sun burn’ type effects on the right leg covered by the non arc rated trouser. If the trouser had ignited the effect would have been catastrophic. Also note that the beekeeper’s hood and gloves are non compliant to the IEC (International Electrotechnical Commission) and ASTM (formerly American Society for Testing and Materials, now an international organisation) standards. Understanding that a need for arc rated PPE exists is not sufficient. With a hoard of non compliant PPE in the market, the end user must be aware of the international testing standards in order to specify such as a minimum acceptance criterion for procurement. A specification outlines the minimum requirements of fabric before these can be assigned the ‘arc rated’ title. Specifications contain a number of test requirements and outline the pass/fail criteria. The test requirements are discussed in separate standards known as test methods. The test method states how the test should be performed and does not contain a pass/fail criteria. Although there are many pass/fail criteria in the specifications, two requirements are discussed to illustrate the relationship between a specification and a test method. ASTM F1506 requires that single layered fabrics not display more than five seconds after-flame when tested using ASTM F1959 test method. ASTM F1959 is the electrical arc flash exposure test. Single layered fabric which burns for more than five seconds cannot be arc rated. Most standards regulate arc rated PPE for thermal protection only and do not address electrical shock, projectiles, shock waves, hot oil release, or other hazards of an electrical arc. The exclusion regularly questioned is the protection against contaminants – namely hot oil release. Hot oil release has resulted in fatalities previously and is a valid concern. Tests have shown that oil increases the ignitability of almost any garment. It is also accepted that little can be done to protect workers who are engulfed in flaming hot oil. Tests show that arc rated PPE dosed with oil burned at the points of contamination. Most standards require that under such conditions, special precautions are taken such as remote operation and de-energised work, among others. A self contained breathing apparatus (SCBA) should be considered when hot oil release cannot be fully mitigated. This will address the hazard of toxic smoke and hot air inhalation. The employer should assess each application uniquely and ensure that workers are not exposed to hot oil release. Arc rated protective equipment should protect a user who is completely engulfed in an electrical arc. Personal protective equipment consists of all items including head, face, neck and chin protection, eye protection, hearing protection, body protection, hand and arm protection, foot and leg protection. A bee keeper’s hood, long sleeved shirt, innerwear or underwear, full length trouser, coverall, jacket and rainwear are categorised as personal protective clothing (PPC). Arc rated personal protective equipment refers to face shields, balaclavas, hard hats, hearing protection, fall arresting equipment, gloves and shoes. Welding aprons and flame retardant coats are not regarded as arc rated personal protective clothing. 1. Head protection – Head protection can be achieved by using a beekeeper’s hood, face shield, goggles or balaclava. The design requirements of the visor on the face shield and the hood are regulated by EN 166, Personal eye protection – Specifications and ANSI Z87.1, Occupational and Educational Personal Eye and Face Protection Devices. The test to determine the arc rating of head protection should be according to ASTM F 2178-02, Standard test method for determining the arc rating of face protective products. 2. Hand protection – The general approach to hand protection is the use of the leather welding glove. Although this glove offers protection, its arc rating is rarely known. The debate regarding finger dexterity is often a contentious issue. Many countries have enforced the use of arc rated gloves while others leave it to the end user. It is recommended that a di-electric natural rubber glove be used under a leather over protector. The rubber offers electrical protection while the leather protects the rubber and adds arc flash protection. A standard test method for determining the arc rating of gloves is currently in draft format in the United States. 3. Miscellaneous PPE – Shoes, socks and hearing protection are usually not directly exposed to the arc. If exposed to an electric arc, fairly good arc ratings were attained from standard issue workwear. Leather shoes performed well when exposed to 50cal/cm2 while yellow hearing protection inserts withstood 25cal/cm2. These items of PPE should be manufactured to the relevant South African National Standard and may be arc tested to the relevant American Standard Test Method (ASTM). Fall arrestors were not discussed in detail during the working committee meetings and hence excluded. With the recent focus on fall protection in terms of fatality prevention, however, a renewed focus is required. ASTM F887 Standard for Personal Climbing Equipment provides the electrical arc testing guideline for fall protection equipment. 4. Clothing – Electrical arc flash hazards are present at low voltage, medium voltage, high voltage and extra high voltage applications. Most industry, mines and small commercial installations consist of many electrical systems which will offer a wide range of available arc energies. For obvious reasons, a customised garment cannot be provided for each calculated incident energy level. Most companies have adopted a simple two garment approach. The daily workwear will be used for frequent daily tasks where the incident arc energy is usually below 25cal/cm2. For higher incident energies, usually greater than 40cal/cm2, a full flash suit is used. The use of melting fibres such as polyester, nylon, acetate and spandex is prohibited, irrespective of whether exposed to the arc or used as an innerwear or underwear. Melting fibres will stick to skin if exposed to an arc. This phenomenon will result in the melted fabric retaining heat on the skin and further damaging it. Some arc rated materials contain low levels of these fibres but these designs offer the user certain benefits. These are acceptable if tested against the standards cited above. In the event of a garment being exposed to an arc, all items of personal protective clothing exposed to an electric arc should be permanently withdrawn from service. It is advisable that the minimum number of laundering cycles be specified, before the arc rating of the garment decreases from its original rating. The laundering cycles should comply with the laundering requirements from the manufacturer. Once the number of laundering cycles has been attained, or if the laundering decreases the original arc rating of the garment, such garments should also be withdrawn from service. In general, fabric softeners and bleach should not be used when laundering arc rated clothing. The testing requirements of arc rated clothing are governed by either the ASTM or IEC standard. At present the majority of arc testing is carried out at the Kinectrics High Current Laboratory in Toronto, Ontario, Canada. Work is underway to expand testing in Europe and South Africa. Protective equipment and clothing manufacturers must take the lead and ensure that products have undergone the requisite testing and acceptance criteria before entering the market. End users should adopt a proactive approach by understanding the testing and acceptance criteria as required by relevant standards. Major harm occurs when non arc rated clothing and equipment ignites. These incidents are responsible for more than 80% of all fatal and disabling injuries. PPE is only one aspect of an electrical safety programme. Industry should roll out electrical safety programmes consisting of specialised electrical safety training, auditing, engineering and behavioural based systems, and engineering studies to determine arc flash parameters.